electro-music.com :: View topic - New gear! Is that a recent discovery? Anyway, great speakers those Martin Logans. That hybrid solution is a great idea! That hybrid solution is a great idea! Still it is not a "perfect" solution. And there's the relatively narrow sweet spot. But the sentitivity,clarity, low distortion make up it many times over for me. I think it comes and goes. Just last night I was dreaming of shooting Robert Hope Jones out of a 128 foot Diaphonic Ophicleide voiced on ten thousand pounds per inch wind pressure. Beautiful in its own way and less bizarre than how he died. Robert Hope Jones, yes... I seem to remember that he supposedly killed himself because he had invented all there was to invent organ wise and he became so depressed that he eventually decided to go for the final stop. It is also quite easy to service.. and the circuitry is pretty cool. I have to agree. I remember them as being rather fun to trouble shoot, and I can't say that about very many things. Well, have a good time with it for sure! And I promise not to shoot you with any diaphonic weapons. And I promise not to shoot you with any diaphonic weapons. But I can still hire you for contract work? Right? Over here in Norway there is mostly rain right now. Lots! Living, as I do, seven minutes walk from Stein, I can vouch for the veracity of his statement. I'd even go so far as to say that right now, Trondheim is ALL rain! Dragon's Lair, what car is that? And what is it that you do that makes one of those a money making asset? I ask in a purely non-judgemental spirit, just curious. It's a nice car, actually. Posted: Mon Feb 18, 2008 5:17 am Post subject: Re: New gear! Subject description: Gear acquisition syndrome - confess now! One musical instrument attracts another. I went to my jam band with my Yamaha MM6 and what do you know but the guitar player said "I have this old synth nobody plays....wanna borrow it?" And he brings this monster Roland D-20 that weighs 50 lbs. Well I know how "borrowing" musical instruments works. They rarely actually want them back but they don't want to "get rid of" them. And even if you don't actually NEED another one, you never turn one down! I took it home and put the 2 synths side by side. The Yamaha is much easier to use and it has hundreds of patches. I can't find more than 3 patches on the D-20. On the other hand, the sound on that Roland is AMAZING. I understand the fuss about "Analog". It's like a record player vs. a CD. Then again, that monster is a back killer, and my Yam I can lift with one hand. Laura, isn't the D-20 actually just a D-10 with added sequencer and a couple of other bells and whistles? I used to have a D-110 module, but that got lost when a repair shop folded while some of my stuff was there. In addition to the D-110, i lost an Akai ASQ sequencer (can't remember the number, but it was the one without the drum pads from the late 80s) and a C-Audio power amp. Ah well. 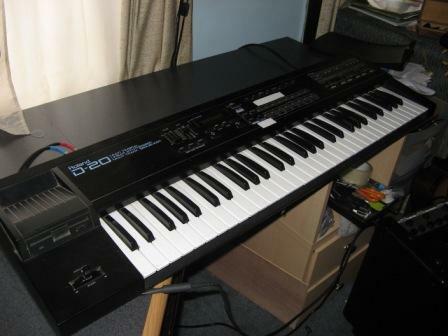 Anyways, the D-20 is a hybrid of sorts.. not really a true analog synth. THat said, it can sound pretty massive. You can find the manual online somewhere over at the Roland site. Hey, I do have a D-110 and a U-110 somewhere! Oskar, do you want them in your rack? I can throw in a Yamaha DX synth as well. The DX is a keyboard model. Thanks. I'll tell you how massive it is. The BASS sounds kill so massively that if our bass player doesn't show up... I could just take over for him! Now, if I could just master that "playing with both hands" thing. Speaking from my own experience as a lesser practitioner of keyboard intruments, I'd say that the best thing is to throw yourself in at the deep end (no pun intended ), as I was part of a band called Live Poets Soeciety, where I had to play both pads, stabs and melody stuff with my right hand, while keeping a bass groove going with my left. I suppose my inexpertise was a boon, as I couldn't get too clever, leaving ample room for the guitarist and the vocalists/poetry readers. Yeah. I started playing in November. We have a killer lead guitarist so nobody expects me to do anything fancy. I picked myself up a Bass for my birthday last year, and since also picked up a Boss COSM Wah pedal, a SansAmp Bass Driver DI, etc. 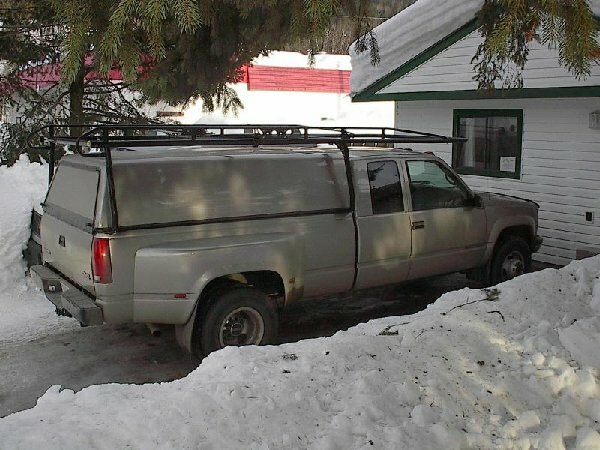 It's a GMC 1 tonne, 4 wheel drive pick up truck with a 6.5L diesel engine. I do home renovations for a living, and I needed something big enough to carry all the lumber, drywall etc, that I use on a job, which saves me on delivery costs. Oh. I thought you meant for taking all your Music Gear to the Gigs.